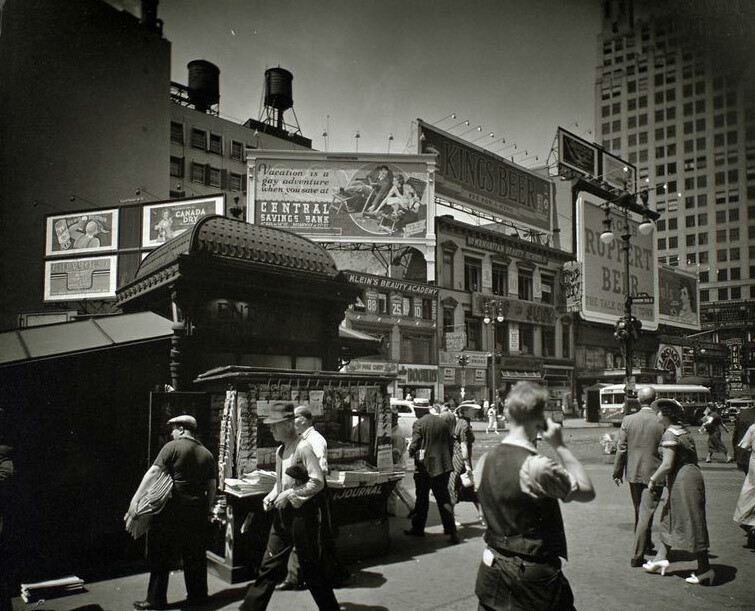 NYPL Notes: Men and women hurry past newstand outside uptown subway entrance, street beyond is lined with businesses topped with large billboards. Men and women hurry past newstand outside uptown subway entrance, street beyond is lined with businesses topped with large billboards. Source: Changing New York. : The New York Public Library. Photography Collection, Miriam and Ira D. Wallach Division of Art, Prints and Photographs. 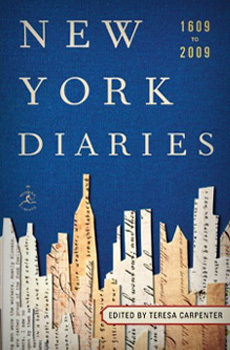 NYPL Notes: Buildings lining Broad Street, including [S]chwartz’s restaurant, left foreground, and a building with scaffolding. Source: Changing New York. : The New York Public Library. Photography Collection, Miriam and Ira D. Wallach Division of Art, Prints and Photographs. 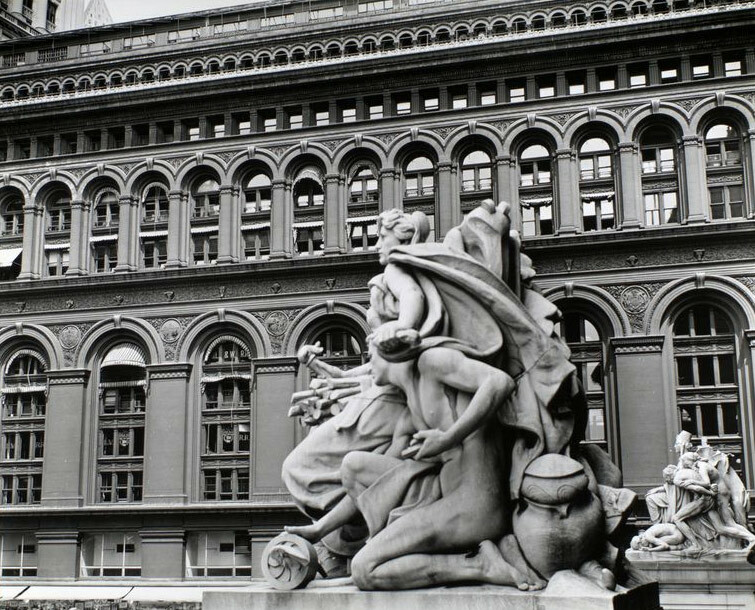 NYPL Notes: Looking up over entrance of opera house, statues representing drama and music, bas-reliefs of Shakespeare and another; sculpture on roofline. Source: Changing New York. : The New York Public Library. Photography Collection, Miriam and Ira D. Wallach Division of Art, Prints and Photographs. 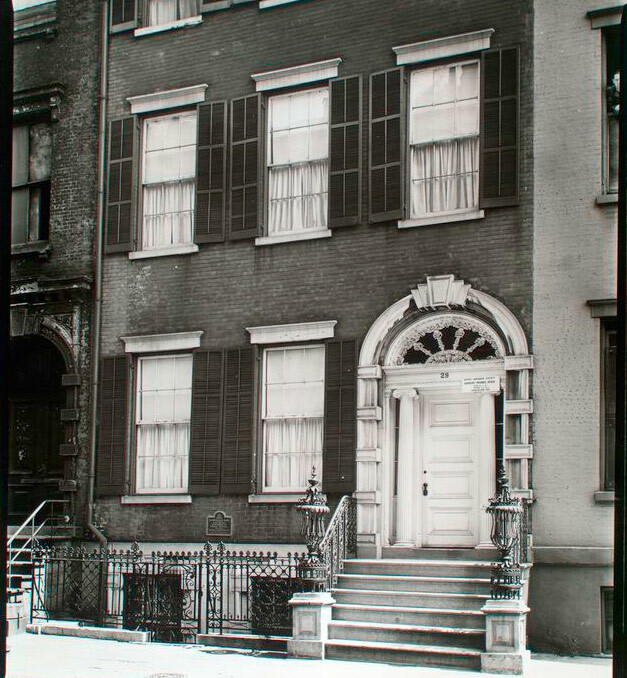 Doorway – Tredwell House (Old Merchant’s House) July 16, 1936. 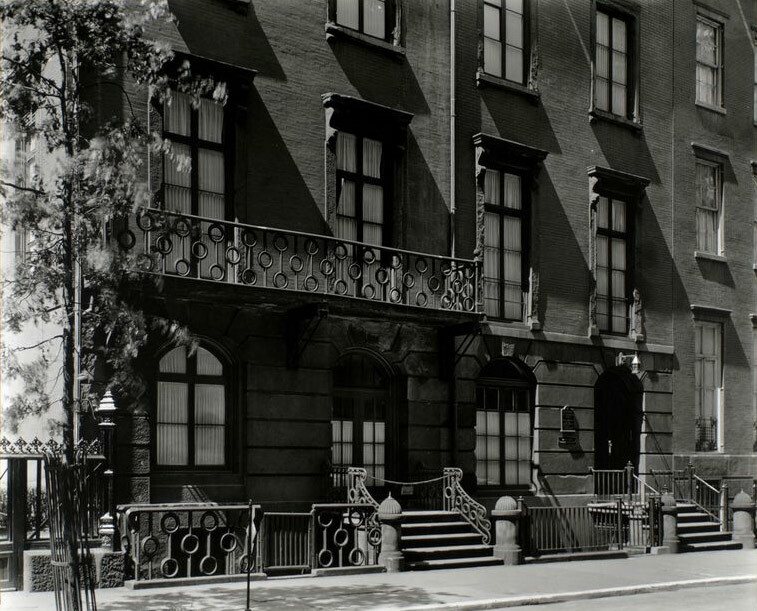 NYPL Notes Facade of Federal Style house has shuttered windows, ionic columns and ornated woodwork in doorway, sign of admission, decorative iron railings. Source: Changing New York. : The New York Public Library. Photography Collection, Miriam and Ira D. Wallach Division of Art, Prints and Photographs. Facade, 14 West 12th Street, Manhattan. July 16, 1936. NYPL Notes: Ironwork balcony on Church House of the First Presbyterian Church. Source: Changing New York. : The New York Public Library. Photography Collection, Miriam and Ira D. Wallach Division of Art, Prints and Photographs. 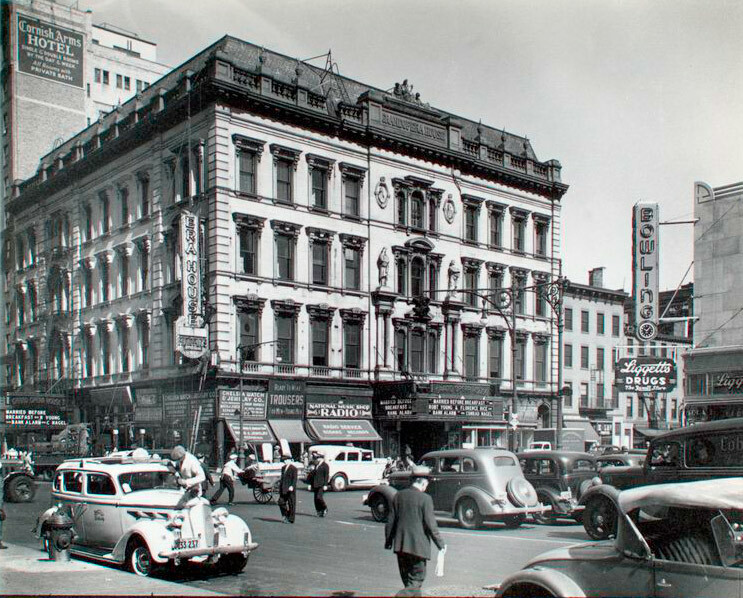 Herald Square, 34th and Broadway, Manhattan. July 16, 1936. 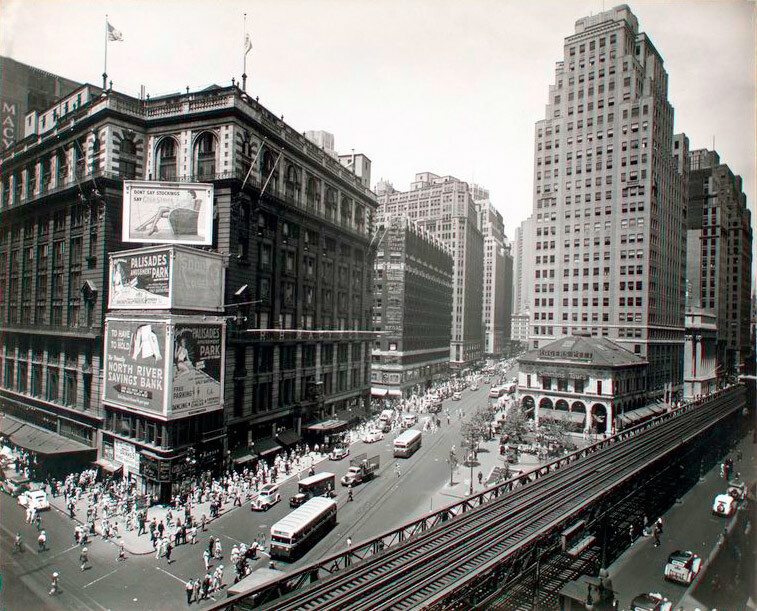 NYPL Notes: Looking down on Herald Square, Broadway continues beyond, Macy’s, billboards on corner, left, elevated railroad and square, right. Source: Changing New York. : The New York Public Library. Photography Collection, Miriam and Ira D. Wallach Division of Art, Prints and Photographs. Penn Station, Interior, Manhattan. 1935-1938. 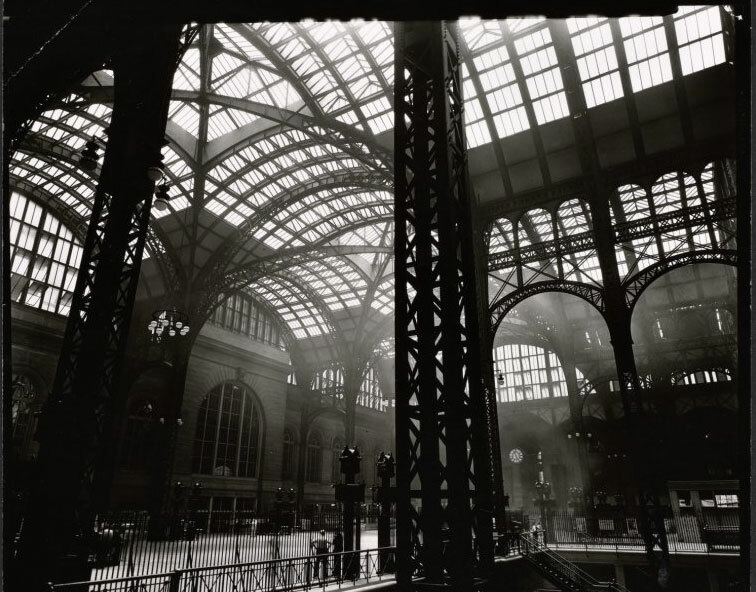 NYPL Notes: Massive steel uprights in the center and to the left, with lighter steel tracery and windows above; men stand near stairway to trains. Source: Changing New York. : The New York Public Library. Photography Collection, Miriam and Ira D. Wallach Division of Art, Prints and Photographs. 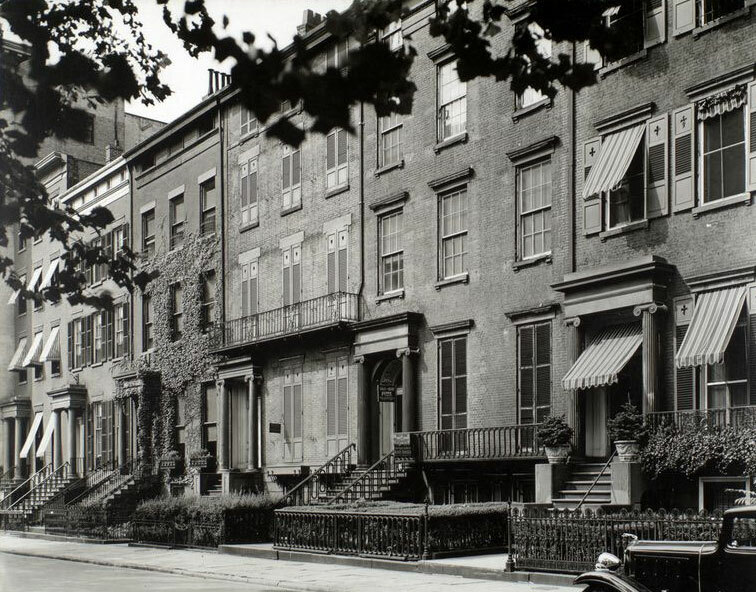 NYPL Notes: Row of brick houses, all with pairs of columns at door, ones at ends have awnings; house for rent is shuttered; Jaguar car partially visible Source: Changing New York. : The New York Public Library. Photography Collection, Miriam and Ira D. Wallach Division of Art, Prints and Photographs. Hanover Square, Manhattan. May 25, 1936. 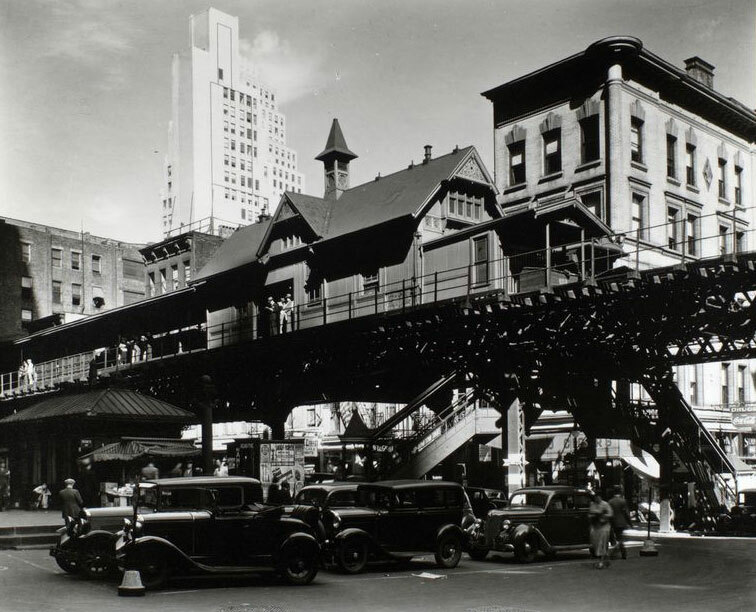 Elevated railroad station in Hanover Square in Lower Manhattan, cars below. Source: Changing New York. : The New York Public Library. Photography Collection, Miriam and Ira D. Wallach Division of Art, Prints and Photographs.